The Cogent DataHub comes with its own web server, which provides support for four different web technologies, including AJAX, ASP, and the Microsoft Silverlight platform that powers WebView, which makes it possible to deliver stunning graphics and performance all from within a standard web browser. Completely built into the DataHub, no need for IIS or any other web server. Full access to all DataHub data, in real time. Point and click configuration makes installation quick and easy. The DataHub also connects to TCP/IP, ODBC and text file sources of data. ASP example code and free Java applets are provided. Supports AJAX to display live data in standard web browsers, hand-held devices and mobile phones. Read more about the OPC to Web. 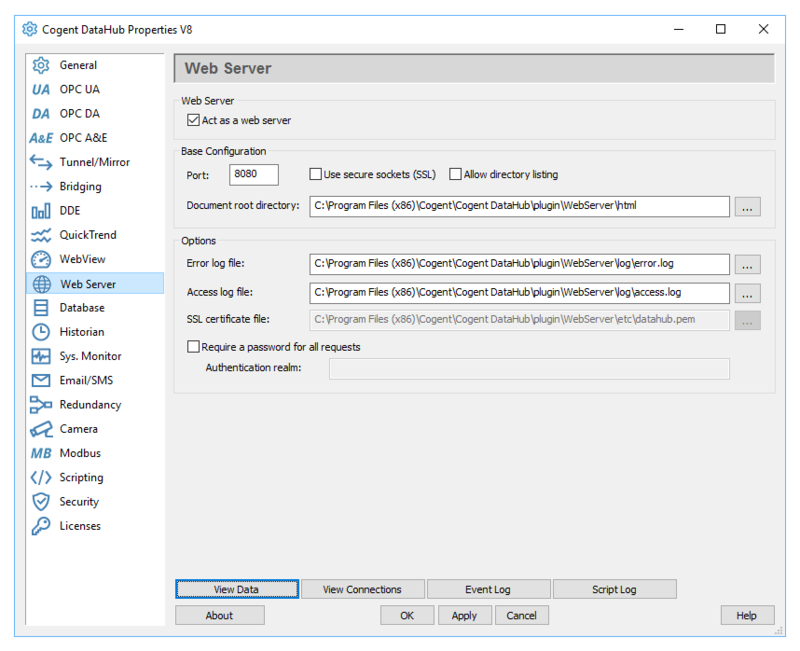 The Web Server is included in any WebView license pack or add-on license, and can also be added to any other license pack.